​Part of appreciating diversity is to understand it within ourselves. Many students in the United States come from multi-ethnic backgrounds, so I used that as the impetus for this exploration. I have done this project as a drawing, but decided 2 layer printing might be a fun media to explore. Before working on any art, students completed a simple worksheet identifying up to 3 cultural backgrounds. Those who were adopted were able to use their adoptive family backgrounds, and those who had less information were able to make general assumptions like European, Asian, Hispanic, African, etc. We spent a day in the computer lab looking for 2 items. First was an animal from countries where the student's ancestors were from. These land, sea, or even insects were to have some characteristics that student felt aligned with their own personality in some way. (wise owl, quiet sloth, fast falcon..) The second item was a symbol for their culture that could be repeated as a background but I asked students to avoid flags knowing those would translate poorly into our project. Some helpful search terms were: Symbols of ____, National flower of ____, Heraldry of ____, Icons of ____, etc. Sometimes a pattern could be found, like clover for Ireland, but other times students put their image into a Google Doc and repeated it. ​All animals and patterns were printed out, and these were placed onto foam trays, similar to meat trays from the grocery store, and traced with ball point pens. They were re-traced more deeply for printing. We added a border to the animals, an echo of their shape, so that the delicate foam would be less likely to rip. This project could be done in linoleum or other printing material, I just had a ton of foam from Nasco to use. ​We used 2 sheets of 18x24 inch paper. The first sheet was for practice, the second was for making 4 clean prints. Students first printed backgrounds on the practice paper. The next day they printed their animals. I had them print one animal in white first, try other colors, but then overlap a color onto their white printed animal to see how it made the color stand out. The white acted like white-out. We spoke about how this is what T-shirt printers have to do when printing on black or dark colored shirts. Flowers by Andy Warhol used as an example of misaligned plates. ​On final paper, they printed backgrounds again, but this time overlapped with a second color on the same plate, faded from the edges. This made colors pop, created mixtures, and I showed them how this was similar to a technique Warhol used. It was challenging to line up prints to get a perfect registration. With our Warhol example, we noted that slight misalignments could be an artistic positive. It showed the work was hand-made, every print was unique, and it did make the edges have a visual vibration that was often attractive. ​In the last image below, you can see how I kept all the printing plates neat and organized. This was very helpful in passing out work daily. ​With backgrounds done, we moved onto our animals. Many printed white first, some preferred the transparency of both the background and the animal showing. It enhanced the meaning of themselves being a blend of cultures. Those who had time continued by adding layers of color to their animals and even trying to print on colored paper as a bonus. As the project ends we will have a show-and-tell session, sharing our cultures, finding similarities, and closing with a review quiz that covers printing from Japan, German Expressionism, and Pop art. Something I discovered was that by setting up my sink with buckets up-side-down was helpful in cleaning. Students put their plates under a stream of water and wiped with a sponge. This way plates were not under water, stuck to the bottom of the sink. It worked really well. I'll close with these two samples of my drawing version of this project. You can see how it translates well into a printing project. ​For more lessons and art education resources, please my "Art Projects" tab above, or visit Firehouse Publications. All their books are on Amazon, but when you order direct, you save 30% or more on books. ​As I get closer to retirement, I find myself wanting to share and organize my 30 years of classroom experiences. As I was documenting classroom samples, I found a ton of pre-digital samples from lessons I have done in the past and still do today. I realized that many of these fall under the category of "no-fail lessons." By that I mean, they are really hard to mess up. We all have these go-to lessons that we enjoy, student's love, and they all have some level of success. Classroom art teachers who work with a broad selection of students from kindergarten through 12th grade. Those who have a mix of advanced, regular, and special needs students in the same room. Subs who come in for long-term coverage who have little background in art. I know from my experience teaching in a K-12 school that the same lesson can often be taught at all levels. The lesson needs to be differentiated, but the main nugget of what is being taught, can be applied to all students. For example, I have a sculpture lesson that can be applied to all levels of students and connects with service learning. Here is a sample image. ​Each grade level can handle this is a slightly different way and with varying levels of depth. Students in high school who have special needs can explore more simplified versions of previous grade levels so that all students are working on a similar exploration. Without sketching, have students create items of food from pipe cleaners or other soft wire. These can be glued to a paper plate. Have a discussion about hunger and create a bulletin board about a hunger issue and display artwork. Have students complete the worksheet (one is provided within the book) to generate ideas. If they are unable to access the internet, have hunger facts in a bucket for them to pick from. Using soft wire, students create a place setting and write a hunger fact on the plate or the placemat. Display in the school lunchroom or library. If possible collect non-perishable items for a local charity or food pantry. Same as above, if possible, allow students to research facts about hunger in the local area, state, national, or international community. They should list facts so facts are not repeated. Students should also create eating utensils. Work can be displayed on a paper plate and placemat with their fact on the border. Use rulers to draw a border as in the example work. Students should sketch as above, encourage more detail, utensils, drinks, and other items for the table like salt and pepper, candles, etc. then display artwork. Students could use lettering templates for the facts. Working on a larger school display, and coordinating with a local food bank can add to this project. Students could be paired with their peers to create additional items for a display that would be more challenging. Decorative cake, candelabra, serving dishes, etc. This could be done as a school-wide service project across multiple grade levels. I have 50 such lessons, but knowing they would appeal to different audiences, I decided to make 2 versions, offering a color or black and white option for each. Color is so expensive to print, and some teachers already have a good working knowledge of art that the less expensive black and white option may be best. But if the lessons are intended for a sub who has little or no art knowledge, then the color edition may be really necessary to understand the point of the lesson. They contain all the lessons, but also more support information that a certified teacher can appreciate and use as well as 25 sub plans that can be copied when you need to be out, with minimal impact on supplies. They contain a ton of media handling information so that you do not come back to a disaster. We know how to clean brushes and use watercolors, and how that might be different than acrylics, but a sub may not. If you have to be gone for a month or more, it's not really desirable for students to just do video notes or worksheets while you are gone. They need to make art. All of these titles are available on Amazon, but if you'd like 30% off, head over to Firehouse Publications and use their Paypal links. Only the Extended Leave book comes in an ebook version on Amazon and iBooks. Because both contain the same 50 lessons, there was no real need to make an additional ebook. "Blade" by Eric Gibbons, oil on canvas, 30 x 30 in. 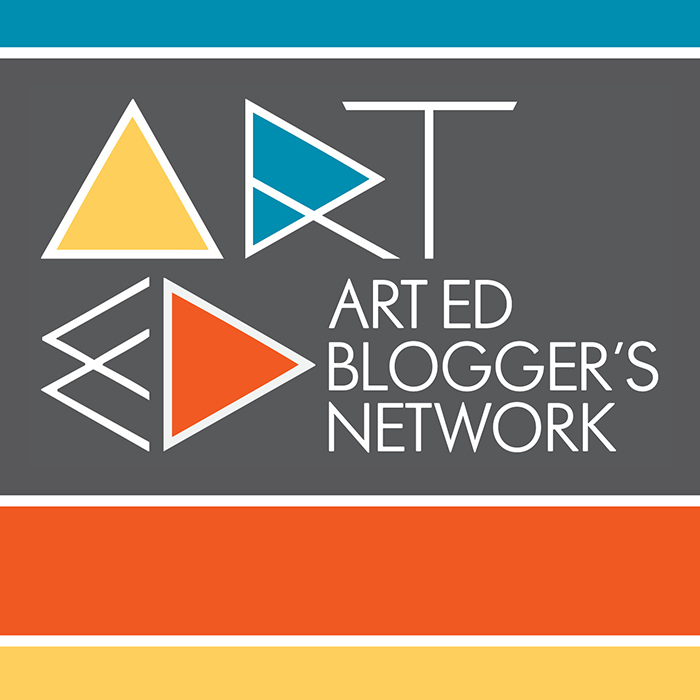 As a member of the Art Ed Blogger's Network, our collective "assignment" was so write about "Artists That Inspire Us." ​My earliest inspiration was the first art teacher I connected with, Mr. Tim Martin back in 4th grade! He graduated from the same college I would go to and was from a program I would participate in at The College of NJ. He listened and encouraged me to be creative. He was my art teacher for only a couple of years and left for a job with the International Olympic Committee to do art. His influence on my artistic soul was profound. ​My second influence was Ken Vieth. As I was making a decision to enter art education, I had a chance to see him in action, teaching in a classroom. As soon as I saw his approach, I knew that was what I wanted to do. In both cases, it was about teaching from an integrated mode of art that connected on a personal level with students. As you look around my blog you will see these influences shine through every post and topic, as well as my near 50 Art Education books at Firehouse Publications, and collaborations like the "If Picasso" series. ​Art teachers are artists at heart. I found that making art, even along-side my students, keeps me refreshed and engaged. If I had a solo exhibition of my work in a gallery, it might look like a large group exhibition. Though I am known for my black and white figurative oils that have received some press, with one in the Obama White House collection, I am just as happy doing stained glass, blind drawings, pottery in a Japanese mode, tessellations, and everything else under the sun. ​This broad love of art, and patience translates well to a classroom setting. There are days I would rather be in my studio, and others where I can't wait to share a lesson with my students. In my own work, I certainly gravitate towards some particular artists. Those who inspire me both as a teacher and an artist would include Jacque Louis David, Ingres, Hokusai, Warhol, Matisse, and Picasso. Perhaps you can see their influence in some of my artworks. Clean lines, organized composition, visual drama, and a pop of color run through all my pieces, and quite possibly my heart. When we are excited about what we do as teacher's and artists, our students feel it. They sense when it is genuine and when we are "phoning it in." I find that staying creative, making works of art, and connecting to masters of the past, as well as those who have inspired us, keeps our creative flames burning. Who has inspired you? Please comment and share below. ​The work of Picasso and Braque can be a wonderful tangent to explore but sometimes students are baffled by the idea of drawing an object from more than one point of view at the same time. I have found that "shattering" the image can be a great first step in the exploration of cubism that students do seem to get at all levels. For younger students, repeating overlapping shapes or lines create a haphazard pattern of shapes on a surface. The more random the patters, I find, the better. Grids and carefully measured patterns create rather robotic 8-bit images (Which is fine if that's what you want) but are more Pop Art connected than cubist. Just as when you stare at clouds images start to form, the same happens with random lines and shapes. The human brain seeks order from chaos. This is called pareidolia. SciShow on YouTube has an interesting video on the effect HERE. For younger students, (K to grade 2) overlapping shapes works well, and reinforces skills like eye-hand coordination and shape vocabulary. The most simple version is to overlap 10 triangles, 10 circles, and 10 squares to fill a drawing page. Then students outline and color in objects they see. It is VERY helpful for the teacher to do this first in the front of the room and have students come up and point out what they see. It will also help clarify the goal of the project for others. ​With older students (grades 3 to 5) , they can do the same thing but with overlapping 30 to 40 random lines with a ruler. Again, a teaching sample with student feedback can be helpful. Encourage silliness and creativity. "It sure looks like a frog with a pizza slice for a head!" These students should take extra time to color in their work with more care, and add textures where they can. In middle school and high school, I have students criss-cross their page with about 50 lines with a ruler. Instead of finding images within the lines, I have students work from a specific image of their choice. It could be a cartoon character, face, landscape, or still-life. Students "force" the image into their random lines. This comes closer to cubism as they need to make visual choices to translate what they are seeing into an unusual format. I tell them it's like painting an image seen in a shattered mirror. ​With these older students, I require that they add textures but also shading to their work so that is begins to take on the illusion of three dimensions. The example above is a ship from a national geographic magazine. I have done this with animal paintings with younger students with some really fun results. You can see that some of their work below. A third option is to do a drawing and then criss-cross it with lines and color each section differently. Below show some portraits done this way and we abstracted the faces by doing blind self portraits. (Not looking at your hands while drawing.) These too came out well. I encouraged those students to work with analogous colors so that the images would be more cohesive.